Many of us would like to incorporate a healing or spiritual practice into the daily routine, but often struggle with implementation. The idea here is to offer beautiful, simple products – infused with healing intentions – that can assist in bringing mindfulness and calm to our day. (The products described below ship only within India. 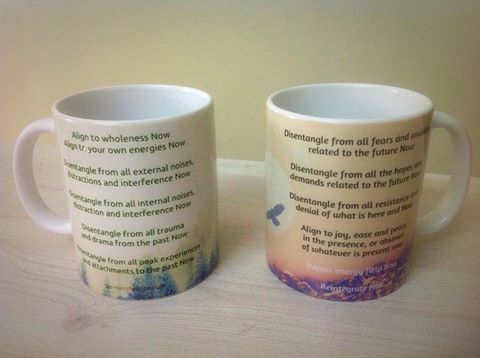 Powerful scripts (drawing on decades of my personal experience in spiritual and healing processes) with aesthetic, soothing backgrounds are now available on 11oz mugs at Rs.350/- (plus shipping at actuals). Take a deep breath, read a statement slowly, and release your breath. Repeat for all the lines. Read a statement, then close your eyes & run your attention up the middle of your body in one quick sweep. Repeat for all the statements. Tap EFT points as you read the statements. 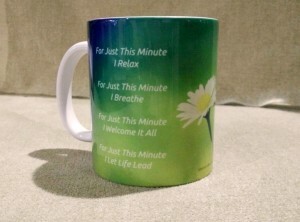 In order to enable their convenient and frequent use, these digital paintings have been made available on 3.6″ by 3.6″ durable, MDF tea coasters. Quieten the mind and sit undisturbed for a couple of minutes. 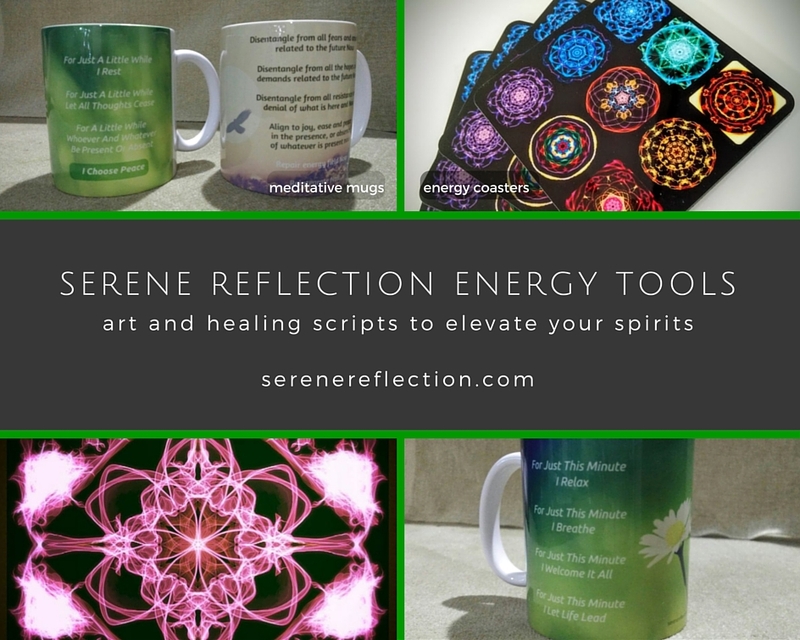 Let your attention be naturally drawn to one of the images, or if you have the Energy Balancing Set, draw one out of the stack intuitively, holding the intent that the one most suitable for your current use be selected. with the intention to receive the benefits, and feel the difference for yourself. 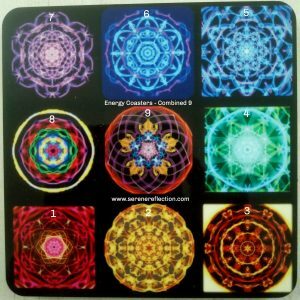 This set of inspired, healing art is designed to clear, activate and balance i) each of the 7 chakras, ii) all 5 elements, and iii) to Reintegrate ourselves, along with bringing the much-needed strength and balance to Yin energies. 9) The 5 Basic Elements of Earth, Water, Fire, Air and Ether. 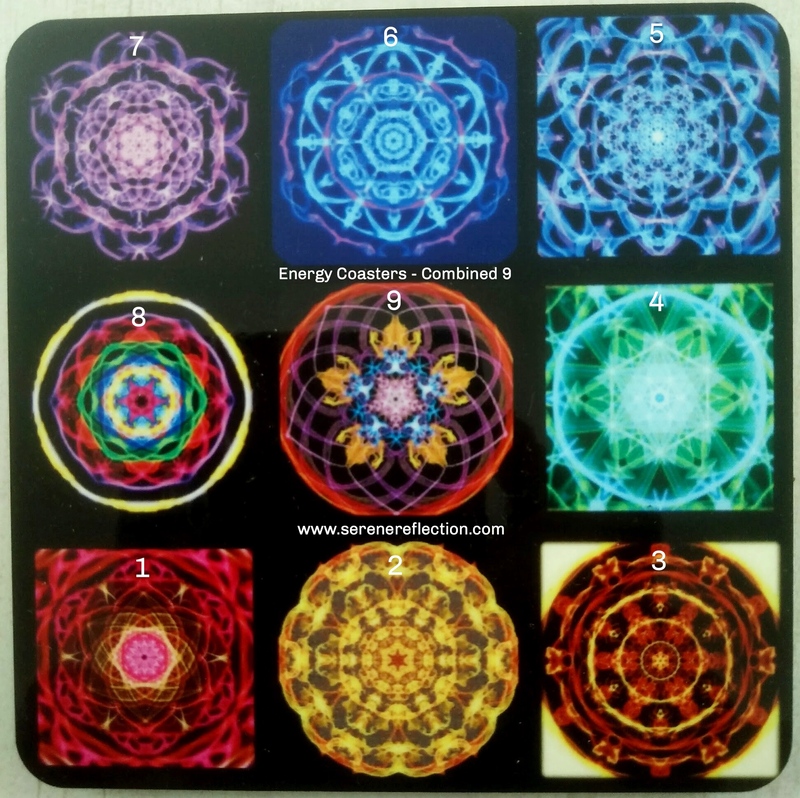 11) Overall Harmonizing – 1 Combined-9 (Designs 1- 9 on a single coaster). Kindly refer to numbered image below (No numbers or text appear on actual pieces.). For more details on each image association please see this pdf. Additional Shipping Cost at actuals. Limited pieces are available off the shelf at my Pune office. Pre-ordering will ensure that your order is in stock. Please email your requirement to besangeeta@gmail.com. Currently, we are only shipping within India and the minimum shipping cost is Rs.55/- or Rs.140/- , as per pin-code. The weight of the order and your address will determine actual cost. If you email me your full address and phone number along with items required, I can provide you with your shipping estimate. These products are also available at Modaks Wellness Centre in Nasik. The Meditative Mugs are now available for regular use(at no extra cost) and sale at Pagdandi Books Chai Cafe at Baner, Pune. 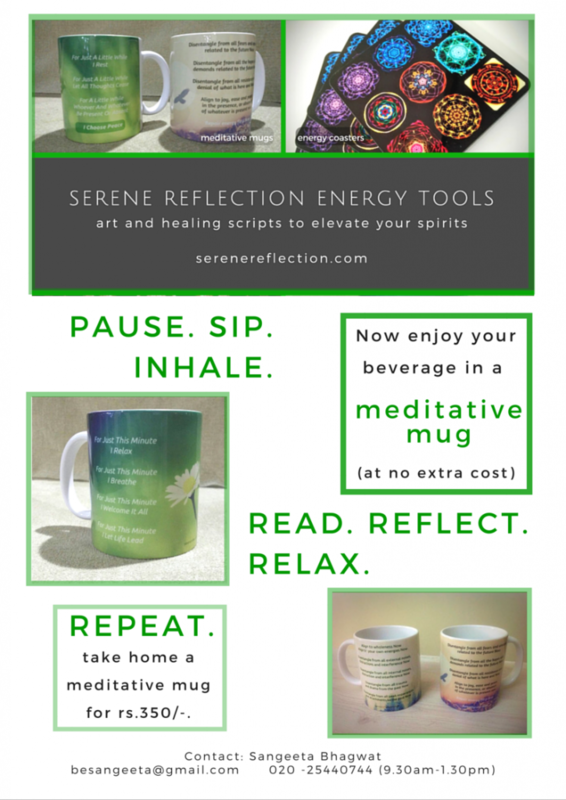 Do ask for your beverage to be served in a Meditative Mug there and write in with your experience. 1. Please read disclaimer before ordering or using products. 2. There may be minor colour variations in appearance of photographs and actual pieces. 3. Returns or exchange are not possible at this time.